Our aerial moon is an exclusive apparatus that’s large enough for two performers to fill the sky. The definition of grace in motion, the moon is lightweight and easy to transport. It’s perfect for creating a magical atmosphere with a dynamic show to wow an entire crowd. 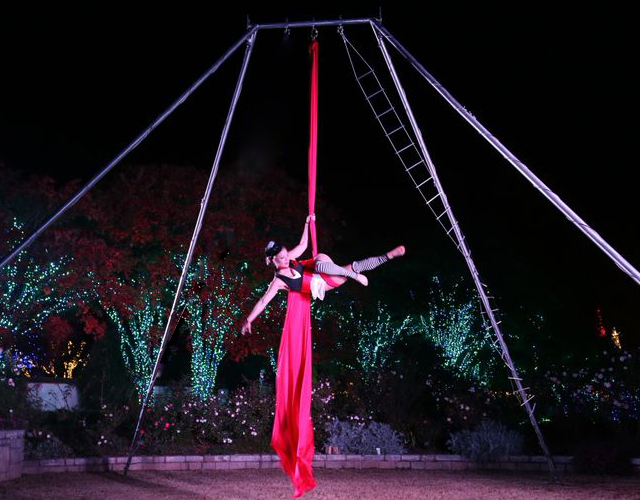 The whirly rig, our custom ground-based aerial apparatus, allows for aerial performances in spaces that cannot support ceiling rigging or with low ceiling heights. This spinning apparatus is on a 4x4 ft. stage and is about 13 feet high. The whirly rig is a wonderful duo showcase that elevates your artists. Our freestanding aerial rig is versatile enough to set up inside venues that do not allow rigging or for special outdoor events. It can stand as tall as 21 feet or lowered to accommodate your space, allowing for any kind of aerial acts or theatrical productions.